There were formerly eleven Barrows on the slopes and summit of the hill, but only seven now remain, and most of these are in a ruinous condition. There are two that are worth noting: one is a rare early Neolithic long cairn (SW 3857 2799) which consists of a 11m (351⁄2ft) linear stone mound built against a natural granite outcrop, situated on a false crest to the west of the summit. 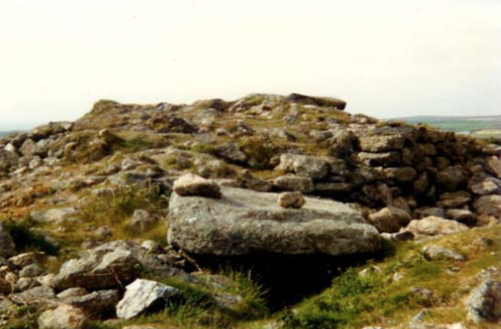 The second is the summit cairn (SW 3859 2807) [pictured right] which is a Late Neolithic/early Bronze Age entrance grave, (c.2500 BC) covered by a mound that was originally 21m (68ft) in diameter and 5m (16ft) high. The remains of the mound were dug into by W.Copeland Borlase in 1879, who reported finding three concentric walls, the most central of which enclosed two stone-lined chambers or cists, containing pot sherds and bones. Chapel Carn Brea, often described as Britain’s ‘first and last hill’, lies to the south of St.Just, overlooking Sennen and the Atlantic ocean. It is 200m (657ft) high, and is a fo- cal point seen from the countryside and cliffs below. The hill is reachable either from St.Just, by taking the B3306 road towards Sennen and shortly after Land’s End Airport taking a left hand turn that leads up to the hill (parking area), or from Penzance, by taking the A30 road towards Land’s End and at Crows-an-Wra taking a right hand turn that leads up to the hill (parking area). From the parking area there is a short (0.25 mile) walk to the top of the hill. The site is owned by the National Trust. In the 13th century a tiny hermitage chapel of St.Michael of Brea was built on the summit cairn, which subsequently deteriorated and was demolished in 1816. In its heyday it was tended by a succession of hermits who kept a beacon burning for travellers and ships. One of these was the legendary Harry the Hermit, who was supposed to ‘raise storms’ against fishermen who refused his demands for tithes. required a huge amount of labour and resources to construct. Although it contained the deposition of pot sherds with cremated bone, the structure clearly is more elaborate (the orig- inal entrance grave having been built on with a large mound) than it needs to be from a purely practical purpose. It is thought of nowadays as being a ‘cultural statement’, a visible cultural presence in the landscape, and a significant ceremonial monument that was visible from many of the other surrounding sites in the area [see page 2 of this leaflet for more details]. It may have been thought of as being the dwelling place of the ancestors of the tribe.